The Rev Dr Martin Buell, or Father Buell as he likes to be called, is 53 years old when we first meet him. He is a high church Episcopalian priest , who has been sent to be Rector of Christ Church, Farrington in Montana. He is a widower with a mischievous, sardonic sense of humor. When the boring Archdeacon Bailey, whom he dislikes, arranges a clergy convention in a hotel at Glacier Park, he wondered "what the archdeacon would say if he knew that the cabins attached to the hotel were sometimes engaged by gentlemen entertaining ladies other than their wives. He toyed with the idea of starting a rumor that Bailey had a pretty girl in one of these cabins, dismissed it as too farfetched." He will be glad to get home because "so much fresh air and so many clergymen are very depressing". He has "five hundred head of white faces (Hereford cattle) which he kept over near Big Timber. When things in the parish became uncomfortable, he always threatened to renounce the cloth and become a rancher. Mrs. Beekman (his housekeeper) would get out her trunks, but she never put anything into them, knowing Martin would never leave the church. What satisfaction could one get out of quarreling with five hundred Herefords?" In the second book, he also acquires a large Chesapeake dog called Bascombe, whose bark is worse than his bite. Martin "was aware of evil - he believed firmly the church's astringent doctrine that evil was in all men, in varying intensity. But having settled comfortably into the parish at Farrington and conquered or held at bay the most virulent enemies of Christianity in his own church, he had come to think of evil as prevailing in places like Chicago." But he was soon to feel it much nearer home. Martin Buell is not exactly a loving father figure: "There are times when I could entirely dispense with people". And about one suspect, he "would say he was as crooked as a dog's hind leg." But he is always ready to help his parishioners, and when told he has some queer people in his church, replies, "Where would those queer people go if they couldn't go to church?" And he is fairly cynical about "pretended virtue": "The church, he reflected, was limited to the people best able, by reason of long familiarity with its forms, to resist religion." One of these "made a trip every Sunday into the vestry to see if anyone had been nipping the communion wine. She made a mark on the botle, and Martin usually moved the mark upward during the week so as not to disturb her convictions about the wickedness of man." He is of "ample girth", "well rounded" and "of comfortable proportions" (by the last book he is said to weigh 210 pounds) and likes to do his own cooking. His house is looked after by the loyal Mrs Beekman, whom he calls Beekie ("She does make a fair pie, I admit. But you could pave a street with her biscuits"). It is she who says that, to impersonate him, "all anyone needs is a big hat, a cigar and a deep voice. A thin person would use padding, of course." She usually calls him just plain Martin Buell. The two of them can be quite abrasive with each other: "Make me a few more slices of these damp rags you call toast." he tells her. She gets the toast, but then demands: "When are you going to get at your sermon?" They are a good match for each other. In fact, she was "the perfect housekeeper for Martin .... Most housekeepers, Martin discovered, wanted to cook, and also, although they didn't like washing, they considered it their place and not his to run the washing machine. He had to fight with them for the privilege. Mrs. Beekham hated cooking and didn't care a rap about washing. As a matter of fact, Martin could have done very well without a housekeepeer, but he found Mrs. Beekman a protection against other women. There were invariably single or widowed ladies in a parish who regarded a widowed rector as legitimate prey. Something about the combination of theology and masculinity was irresistible to these ladies. You couldn't run a church without women, and yet women were what made running a church difficult." 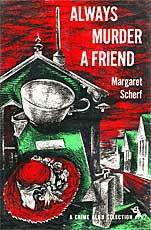 Margaret Scherf (1908-1979) was born in Fairmont in West Virginia. Her family finally settled in Montana where she left college before graduation to take a job as an editorial secretary for a book publishing firm. 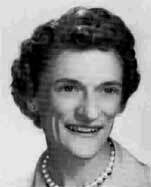 She moved on to become a secretary and copywriter, then in 1939 left her job to become a full-time writer, except for a time during the Second World War when she became secretary to the Naval Inspector at the Bethlehem Steel Shipyard in Brooklyn. She was to write some thirty mystery stories, including the seven Martin Buell books described below. She did not take herself too seriously and explained, ""My idea was to write amusing books, without too much gore but with sufficient suspense to carry the reader on." She did not marry until she was 57, when she helped her husband run his cherry orchard, as well as writing, working in the antique shops she owned, and being elected as a Democrat member of the Montana state legislature. She died, the victim of a drunk driver. The Rev Dr Martin Buell is sent by his bishop to take over the parish church in Farrington, Montana, with some misgivings. He knew it was a difficult assignment because the church and town were dominated by Seneca Wibble, an argumentative old lady who fancied herself the spiritual as well as the social arbiter of the congegation. "Every parish had its witch, and Mrs. Wibble was undoubtedly the witch of Christ Church, Farrington." But he hadn't reckoned on finding a corpse the very night he arrived. Then other bodies follow. Meanwhile, he is kept busy standing up to the objectionable and ever-demanding Seneca Wibble, as well as trying to revitalize his tired congregation, not to mention tracking down the murderer, even though Sheriff Clyde Hunnicut seems to regard him as the main suspect. But then, as Hunnicut tellls Martin, "I'm no sleuth. I hate crime. I wish people would resist the temptation to kill the people they don't like. It shows a mean, vindictive spirit, sort of radical and un-American." Not surprisingly he prefers horses. As he says, at least they don't murder each other. It starts with the promising dedication: "To the people who have been complaining about the low type of character dealt with in detective novels. In this story we promise to killl at least two nice people." And it all develops in an entertaining way, even if Martin does get knocked out in the process. The problems of the parish seem real enough: "The parish looked promising, but, like all parishes, it had its bumps to be got over.There would be quarrels, and the ironing out of quarrels. There would be trouble getting the money and more trouble spending it. Somebody would want a new organ, and somebody else would want a new building. A parish was always in turmoil, however quiet it appeared on the surface. The quieter the more ominous." But at least "the rectory looked comfortable". It all leads up to a highly surprising ending, and it gets the series off to quite a promising start. For the Love of Murder starts at a clergyman's convention where The Rev Martin Buell finds that his room-mate and fellow clergyman, Gilbert Snively. has inexplicably died in the night. Then Sniveley's widow is killed in a car accident. Could these be murders? Martin finds himself quite literally holding the baby who was found in the wrecked car, and has to take him home to look after him. His housekeeper Mrs Beekman (Beekey to him) rises to the occasion until a more permanent home can be found for him. But then he begins to make some odd discoveries, as when his watch is found in a bottle of ketchup, and his sweater is found in the flour-bin. Next, his arch-enemy, the local loan-shark, is found shot dead in Martin's sitting room. But in the end, Martin gets everything sorted out. The plot is not really too engrossing and there is little exciting action, but what does shine through is the author's dry, almost acid, sense of humor. After the two Sniveleys have been killed, Buell shrugs his shoulders: "This was a very unfortunate convention for the Sniveleys". When Buell comments to his friend Sheriff Clyde Hunnicut that "there's something queer about that baby", the sheriff replies, "All babies are queer. That's why we get such queer people." Martin Buell is curious and likes a bit of excitement, but he is no saintly figure and seems to have few church duties except for preparing an odd sermon or two. 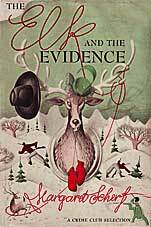 He only solves cases, according to Mrs Beekman, "by snooping around until the murderer bangs you on the head". However this book, like all the others in the series, is short (even if the chapters can sometimes seem rather long). and Martin Buell himself is an interesting if at times a rather strangely remote character. Divine and Deadly sees Martin Buell supposedly on August vacation, but in reality soon being pressurised into giving "talks on God" to the campers of the World Amiability Group. "You don't need a rest, Buell," the archdeacon tells him. "You rest all year. Faced with an appalling diet at the camp, he offers to cook custard pie - but unfortunately arsenic finds its way into it and two people are fatally poisoned ("Two gone and one on the brink," as one of the characters cheerfully puts it). Then an attempt is made on Martin's own life, an attempt that lands him in bed with an injured leg. He is cheered up by the arrrival of a bottle of good bourbon from a notoriously lovely widow. He welcomes the gift as he is "always interested in matters of the spirit", but then found that it was this very same lovely lady who was the police's main suspect. DIVINE PROGRESS, INC. SOPHANIA BUDGE, FOUNDER AND WORLD LEADER. STEP INSIDE AND SEE HOW THE UNIVERSE IS GOING. WATCH OUT FOR LOOSE FLOOR BOARD. She shows him her charts and explains,"I have separate charts for God and man, of course. Hits, runs and errors. Man is lagging at present. In fact animals seem to be running ahead most of the time during this decade. Man and God are rather behind the animals, particularly the horse. I have friends who consider the horse the next vehicle of civilization." She has "a large tin basin over which a sign read: Help the Cause. Martin found himself able to resist this appeal, particularly as he couldn't locate any buttons or slugs in his change pocket." All this is good fun. Then there is a visiting English clergyman called Sir Wilfred Soper of Upper Topham who seems eager to help Martin in his detective work - but the funniest thing about him is his name. And the amiable Bishop Kingsley who, Martin recognises as "that rarity among bishops, a spiritual man". Martin himself is as sardonic as ever: "Women," he grumbled to himself. "You can't make Christians of 'em and you can't run a Christian church without 'em." As he tells Dr Yates, "Once let 'em get the upper hand and you're sunk, Yates. They begin to treat you like a Pekingese on a string and you have no more say in your own church than the janitor." But his trusted housekeeper Mrs Beekman continues to support him, at least some of the time: "He looks a bit dense," she explains, "but he has moments of illunination." As does this book, despite the unlikely plot. Recommended. The Elk and the Evidence starts with Martin Buell unwrapping a gift elk roast to discover in the package a neatly severed human toe. Then a visiting hunter is reported missing in the neighbourhood, and Martin thinks there may be a connection between the two events. He is asked to help Katy Collins, a strange but attractive young woman, who had almost been drowned after seeing a dead man in the Pullman berth below her on her train. And her description of the corpse seems to match that of the missing hunter. But her life is still in danger and Martin who "did not feel he could risk the fury of his parish by taking in a young and very attractive female" has to persuade his neighbour old Henry Beaver to take her in to his house. But then she disappears and complications ensue. Martin "reflected that there was no end to the trouble you could get into when you thought you were doing a noble deed .... The more people involved in a Sir Galahad action the worse the consequences, generally. It was not a subject for a sermon, but he often wished he could make one on it. There seemed to be a direct ration between one's assurance of saintliness and the extent of the damage that resulted." Church matters do not take up too much of Martin's time, and, as he was too distracted to prepare a new sermon, "he went to the (rectory) basement, removed some birch logs from an old trunk, opened the lid and selected at random one of his earlier sermons. He was sure it would be good - all his early sermons were good. One of the proper dividends of middle age was the clipping, now and then, of a coupon from the labors of one's youth." He "hoped no one would feel it necessary to inform the bishop of his extra-clerical activities. Kingsley (the bishop) was an old friend, he understood Martin's weakness, but he had a proper concern for the dignity of the cloth and these excursions (such as Martin driving 350 miles through a blizzard to help dig up a body that might or might not be that of the man who had lost his toe) always made him feel uneasy." As usual there are some amusing comic passages, even if the plot gets a bit tedious - but towards the end, when a girl goes missing, it does get quite exciting, even if the inevitable explanations that follow are over-prolonged. But as Martin's friend Sheriff Clyde Hunnicut tells him. "Whenever you get into something it immediately becomes highly improbable". It sure does. The Cautious Overshoes traces the possible connection between the badly charred body of a young man discovered in a freight car and the missing Dean Castleman. Dean's sister, Diana, had asked Martin Buell to help her discover her brother's whereabouts, and he does this after identifying the footprint of a pair of overshoes that have had a special strip added to them to prevent slipping. It is not really a very interesting plot, set as it is partly in Montana's capitol of Helena, where the state legislature meets and "there's a hell of a lot of progress going on" as one of the characters complains. In the state house, "Each man had his own brass spittoon, with insurance in the form of a rubber mat. Comfort was further served by a swivel chair, which tilted back to permit the feet to rest on the desk, and the newspaper to rest on the stomach." The author knew about all this, of course, as she was herself became a member of the legislature. The most amusing bits are incidental to the plot, as when Martin is happy to accept hospitality: "Any little snack will be better than the pea soup Mrs. Beekman is brewing for me. She's read something that makes her believe I need pea soup. If I didn't feel sorry for the sick, I'd take it to them." Then there's Diana's mother who "did not object to Diana's joining Christ Church, although she herself preferred filleted Christianity - the bone of doctrine and the skin of form removed". Martin's investigations as when he rifles through a suspect's mail ("In theory he felt it was downright dastardly to read other people's mail, but in practice it sometimes proved interesting and informative") leads to him wake up one morning to find a gun being pressed against his chest. Unfortunately, though, the story is more about what happened in the past rather than a description of exciting adventures in the present. It is not one of the more interesting books. Never Turn Your Back gets off to a really good start. When Martin Buell returns early from a tedious conference, he finds that "there was no light in the rectory. Then he saw that there was no rectory. The old building was gone, and in its place stood a new house, all windows, that looked like a corsage box". It turns out that his church vestry members had decided to present him with this "nice, modern house", just what he did not want. But "Barry Collins had some prefab houses to get rid off, and here was a place to unload one, so he talked your vestry into buying one for you." Also, "the ladies of the Guild had decided that Martin's furniture would not fit into his new house and had taken it upon themselves to trade it in on Modern pieces .... Mr Collins also had an interest in the furniture store and gave them a tempting discount." Even his precious old trunk full of old sermons had disappeared. As his neighbour, old Henry Beaver, put it: "The vestry wanted it to be a surprise". Henry grinned at him. "Was it a surprise?" Then a box is delivered at the Collins household that is supposed to contain a grandfather clock - but what it really contains turns out to be a grandfather, no less than Mr Barry Collins himself. Martin and his old friend Sheriff Clyde Hunnicut (who had "two interests in life: crime and horses. Horses came first") discuss the mystery, but Hunnicut is not keen to get too involved. "Martin was not entirely dissatisfied. He had always wanted to work out one case by himself, to prove he wasn't just the bungling trial-and-error companion of the sheriff." Other interesting characters include Dr Waldo Emerson, pastor of the Prebyterian church, who habitually has "a doleful eye. It was not difficult for Dr. Emerson to look doleful: it was a cultivated part of his Christian appearance. He had the same doom-laden countenance when he asked his board to pay his utility bills as when he spoke of hell. Martin suspected the source of his gloom was his breakfast of lemon juice and bran. 'Aren't you out of your way, Buell?' he enquired, sitting down and wrinkling his long nose. 'Ah - I forgot for the moment your principal interest in life - crime.' " It is this Dr Emerson who later tells him, "There is no antidote for grief like hardwork, is there, Buell? "No," Martin agreed, "thankful that he seldom had to use this antidote." Martin does not hesitate from setting off on a nine-hour car drive to Glacier Park, from where the box had been sent, and where "the tourists were hard at work at their daily chores of sorting post cards, licking stamps, and selecting such useful items for their friends as outdoor privys and indoor pots stamped Glacier National Park." Despite this lively start, the pace then slows down, and, although it is a short book, its long chapters start to get rather tedious, although it comes to life again at the end when Martin's unwanted new house blows up, and (believe it on rnot) he recovers his old one! The Corpse in the Flannel Nightgown sees Martin Buell about to have (another) vacation when he is ordered to drive 400 miles to Flathead Lake where his domineering parishioner, Selma Colfax, (who "was as meek and humble and self-effacing as General de Gaulle") seems frightened for her life. "Ordered you?" his housekeeper queries. "Nobody orders you, Martin Buell, You're curious. That's why you're going." Martin had been told to let himself in to Selma Colfax's house - but next morning she does not appear. He finds her lying dead on her bedroom floor, with a little revolver beside her. Was it suicide or murder? Martin soon gets involved not only with her immediate relations (an interesting if odd family) but with her daughter's cousin's husband, Morley Japlin, an eccentric character who had worked for the State Department in "the period of American diplomacy when specialists in Henry James were teaching elementary English grammar to the equatorial Africans. Morley Japlon was such a specialist, and his assignment had been Haiti." But, since he got back from Haiti, he seems ever scared that something is going to happen him and jealously guards a strange old briefcase. Martin wonders what is in it: "It was locked, but it was a very simple lock. A bit of pressure from a screwdriver ... Ought not to do it, of course. He did it, quickly, before his finer instincts got the better of him." But it does not seem to contain anything of value. Could it be that Joplin has something hidden behind the heater in his trailer? Joplin is approached by another intriguing character, the handsome Mrs Ryan who was 'beautifully turned out" and says she is there to offer Monty a job in a new college that is being set up in California. But, as Martin notices, "she never once mentioned the learning situation, or empathy, or splended rapport. You can be sure she's not an educator." It's an interesting, fast-moving, really humorous story, with plenty of action, helped along by the author's return to short chapters. Martin himself manages to get attacked several times and his dog Bascomb gets a chance to come to the rescue. Martin even manages to find a use for a dead mouse in an endeavour to trap the murderer. Parts sound strangely relevant to life today as when the local doctor decribes Joplin as being "part of the long meddling arm of the State Department ... dealing out democracy for the savage." "Who's going to defend the weak, who's to report what these tyrants are doing to their innocent people?" demands Joplin's wife. "It's not our business. We're trying to take on the whole world, like some giant nursemaid with a thermometer behind her ear and a pistol in her pocket." Joplin turned to Martin. "Are we our brother's keeper, Dr. Buell?" "We are. But I'm afraid we can't do it all." This was the last book in the series, published the year that the author got married, although she did go on to write other detective novels. It is also one of the most amusing stories. Recommended. There is an interesting article about the author on the Rue Morgue Press site. The covers look very confusing, but the one below at least gives a good idea of the author's humorous approach.